Located in a commanding position on the edge of the sleepy village of St Just in Roseland, Tantallon benefits from outstanding panoramic views of St Just Creek and beyond across the waters of the Carrick Roads. From almost all of the rooms, you can look down upon the historic churchyard at St Just in Roseland and at the boats gently swinging on their moorings in the creek. The garden is spacious and benefits from a huge rear patio area for the morning sunshine and a deck area to the front for afternoon and evening sun. The whole site is shielded from the road by a high hedgerow and therefore is particularly private and quiet. The harbour village of St Mawes is literally one mile to the south, there are some delightful beaches nearby and the whole of the Roseland Peninsula is on your doorstep. Tantallon has been progressively refurbished by its Owners over the last few years and now offers accommodation for up to 9 over 2 floors in the main house and a single bedroom studio in a separate annexe. All the rooms in the house are immaculately presented and all benefit from the breathtaking views. The living room is a particularly relaxing place to be and has a selection of very comfortable chairs where you can relax and look out on the boats in the estuary. Ground Floor: The front door leads into the kitchen area and through into the dining area. The living room, master double bedroom with ensuite shower & bathroom, family bathroom & separate shower room all lead off the main corridor. The master bedroom is quite superb, having dual aspect and a door out onto the rear patio so you can enjoy some morning sun. It also benefits from a super-king sized bed. 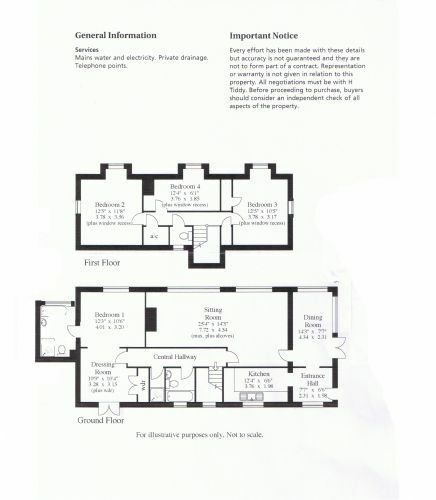 First Floor: The stairs lead to the first floor with one double bedroom, one twin room and one single bedroom. There is a separate WC and each of the bedrooms has a wash basin. Separate Annexe: Double bedroom with en-suite shower room and small kitchenette. External: Rear patio area with outside furniture, patio deck to the front with outside furniture and spacious grounds. Heating is oil fired central heating throughout and there is also and open fireplace in the living room. There is a TV/DVD/VHS/Digital TV recorder in the living room. The master bedroom also has a TV, Digital TV recorder & DVD and the first floor double bedroom has a TV & DVD. The kitchen has an electric range cooker, washing machine/dryer, dishwasher, microwave, large fridge and freezer. There is WiFi throughout the property. There is a Weber BBQ for use if required. Electricity, bed linen & towels are all included, but we would request you bring your own beach towels. There is a large parking area at Tantallon with easily space for 4 cars. Up to 2 well behaved dogs are welcome at a small additional cost of £25 per dog / per week. We regret no smoking is permitted. We regret strictly no large groups of guests under the age of 25. There is a cot and high chair available upon request. There is a fixed stair gate at the top of the stairs and, if required, there can be one at the bottom of the stairs. £300 pre-authorised to your credit or debit card as a cautionary security deposit is required. The little village of St Just in Roseland is located about 2 miles north of St Mawes. A quiet, sleepy little village, it has a pretty little creek and the quite delightful church and wonderful churchyard. No visit to the Roseland is complete without seeing this peaceful place. Probably the only sub tropical churchyard in the British Isles, it is a beautiful & tranquil place with some unique flora. Guest from Bucknell stayed for 7 nights. Lovely view and quick for walks to the beautiful st just church and 5 minute drive to st maws In my opinion parts of the property could do with an update- i.e. new bathroom downstairs. We really Enjoyed our stay. A lovely situation with good views over to Mylor. The house is of a period with some modernisation. It has a lovely garden which we would have used more in better weather. We had the whole family so the annex and large gated large parking area was really useful. We enjoyed our time there. House is in an excellent location with lovely views. The outside terraces, decking and garden were very good for a family holiday. We had a wonderful time at Tantallon, the check in was flexible and easy, only one minor problem on Christmas day was fixed in less than an hour even thought we could easily have waited. The kitchen was fully outfitted which made holiday cooking a breeze. The views are stunning, as is the fireplace if you are so inclined, and the cottage itself is perfect. There are lots of lovely walks and pubs in St Mawes. We had a great time thank you so much. Guest from Oene stayed for 7 nights. We spent a week at the house at the beginning of July. We has good weather so we were able to make full use of the garden and outdoor decking area. The house has a lovely west facing view over Carrick Roads and some local farmland. The bedrooms were comfortable and all had windows with views to the west. The living areas were well appointed and a pleasant place to be. The heating was on hot when we arrived which we turned down. We soon figured out how to keep the house cool during the hot weather after a few days. We were able to park three cars on the driveway. Access to the driveway is steep so caution should be used with the angle of approach for vehicles. Guest from Little Leigh, Near Northwich stayed for 14 nights. A big thank you to the owner who had taken on board my comments following our visit earlier in the year and had addressed all the points I had made. This made for an even better two weeks here despite a lack of sunshine and I would thoroughly recommend Tantallon to anyone wishing for a comfortable, spacious and well equipped house in a great location. It is so conveniently placed for proximity to wonderful beaches (lots being dog-friendly all year) plus the fact that you can reach the coastal path by foot in minutes so a great spot for walkers too. Also with the picturesque village of St. Mawes just two miles away you are not isolated - you can pop down for your shopping, have lunch here or even take the beautiful coastal path and enjoy a walk for your daily newspaper! We hope to be back again here again very soon. This property hit the mark for us. Fabulous views, excellent location, clean, tidy and very comfortable. A well equipped kitchen - sharp knives, big pans, serving dishes, great oven are always missed out in self-catering but not here. Great for our dogs & the space and privacy was much appreciated. BBQ was clean & we enjoyed using it. Possibly the patio could do with a little sprucing up - painting the wall would make a huge difference as would improving the container planting, and maybe windbreaks to make it even more user-friendly. If you want a relaxed holiday I would highly recommend Tantallon because the owners have got their priorities absolutely right. A wonderful two weeks at Tantallon in the beautiful Roseland Peninsula. Tantallon is a lovely house in the most marvellous setting with stunning views down the valley to the creek below. The gardens are lovely with many different shrubs and plants and we would have made use of the decked area had the weather been warmer. The comments we make below are points we feel should be addressed and both prospective holiday renters and the owners should be made aware of. Firstly, on entering the property is a sign stating that any electricity used over £15 per week is chargeable. This is not according to the booking confirmation that states it is included. Also, there are no instructions for the heating. You are also requested to do a fairly thorough clean upon leaving which we would have done anyway. We did not use the BBQ but it had been left in the boiler room in a dirty condition. Most of the two weeks we were there the weather was bright but cold and we had to supplement the heating by purchasing coal and logs for the open fire. The warmest room in the house was the master bedroom en-suite as the large towel rail was extremely hot which we switched off during the day whilst we were out. The Conservatory/Dining Room was very cold indeed although there was an electric heater in there with a broken foot. The left side of the electric double oven in the kitchen needs attention as it is not heating up sufficiently to cook or grill.There was no instruction book available.The bottom of the garden needs adequate fencing. There is currently an open rope fence along the perimeter. Although there are disclaimers throughout the property advising children not to be left unattended in the garden I think it is an accident waiting to happen as there is a steep drop into treetops on the other side. Fortunately we have a sensible dog but I was initially concerned for her safety and would have been paranoid had I had children with us. Despite all the foregoing we had a great holiday and would return to Tantallon. It just needs a little TLC! Tantallon was in a very good position,close to St.Mawes and plenty of local walks; beautiful views from most rooms. Strange instructions from the owner, to clean and hoover throughout,including cleaning all toilets,showers etc.on the day we left. We are happy to leave holiday homes empty of rubbish and tidy,but the cleaners are employed for a reason. There was also an instruction to remove the TV aerial if a storm threatened, which again sounded odd. The usual holiday home problem of several vital lightbulbs which didn't work.It's easy enough for cleaners to check this in between visitors. The electric oven struggled to reach a temperature hot enough to cook anything,but the hob worked ok. The house was advertised as electricity included in the price,but a letter from the owner on arrival made it clear that we would be charged for any use above £15.This should be mentioned in the original advert, or it is just misleading. Otherwise a pleasant house in which to holiday on the beautiful Roseland Peninsula. Guest from Newark stayed for 7 nights. A beatiful and well equipped cottage. A beautiful and well equipped cottage, and cot and high chair were provided. Only suggestion I would make is to provide some plastic plates and cups for children. I'm not quite sure why we were asked to telephone the owners an hour or so before our arrival as it seemed to inconvenience them- but I suppose they need to be certain that renters are coming. Guest from Cheltenham stayed for 5 nights. Guest from Wokingham stayed for 7 nights. Really lovely location with some great walking trails and a charming property, the view in particular was incredible. Owners were friendly and helpful.